Oh man, did I need this! I’ve been sitting on my Isabeau Purse for a few years now because I had no idea how to line it. But now I can try my hand at this tutorial and see if I can indeed Sew a Lining for my Knitted Bag! Updates soon. Here’s a great post on reverse engineering an Estonian lace pattern. Double-pointed and circular needles are often not marked for size and they almost always get separated from their original packages. I mark them with a fine-point permanent marker (two dots for size 2). The larger needles usually have enough space to mark the actual number. It works for all needles (wood, metal, and plastic.) I never have to search for my needle size gauge. Also, I keep a complete list of the needles I own in my purse, so I know at a glance whether I have to buy needles for a new project. Keep your pattern and the copy of your pattern that you marked up and notated in a plastic sleeve in a 3 ring notebook. Slip in your swatch and a picture of the finished project as well. This way, when looking to make another of that pattern, you’ll have all your notes right there, suggestions for what you’d like to change for the next time, and how it turned out the first time. All your notes, etc…are all in one organized place. Free yarn bras: Ask your florist to save you the plastic webbing that protects Fuji mums and other large-headed flowers during shipping. This webbing is a lightweight version of the material used for yarn bras, and florists throw it out. A little cleaning with soapy water will remove flower residue and voila! Yarn bras for all those 50 g./1.75 oz. yarn balls! A larger, more sturdy version for larger skeins can be found at some wine or liquor stores. This larger webbing is used to keep bottles from clanking together in consumer’s shopping bags. You can also use the wrappers around asian pears. It all boils down to simple chemistry. Household liquid bleach is a basic chemical, with a fairly high pH of about 10. Bleach whitens clothes by releasing oxygen that combines with chemicals in dye, making them colorless. The higher the pH of bleach, the greater the amount of oxygen that’s released–and the whiter your clothes become. Like bleach, cotton fiber is also on the basic side of the pH scale, and cotton usually bleaches well. But wool is acidic. When you combine acidic wool with basic household bleach, you get a chemical reaction called a neutralization reaction–and the result is that the bleach dissolves the wool fibers into a goopy mess! You can do it, but you have to be careful. You can follow these instructions, but you should test a small piece first to make sure it will be alright. [[Kanzashi]] are created by Japanese artisans from squares of silk by a technique known as tsumami. Each square is multiply folded with the aid of pincers and cut into a single petal. These are attached to backings of metal to create whole flowers, or attached to silken threads to create strings of blossoms…. Geisha wear different hana kanzashi according to the month, or public holiday. In the summer months (June to September), jade ornaments with white or silver themes are worn. During the winter months (October to May), tortoiseshell and coral kanzashi are worn. “An industrious knitter could just about finish a man’s stocking in a 15-kilometer stretch of even, easy walking. So said an 80-year old woman from Leksand in the 1890′s.” — Brigitta Dandanell-Ulla Danielsson, 1984. 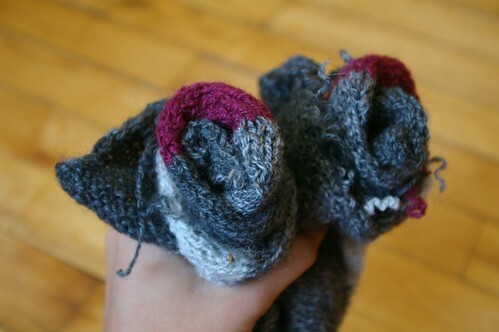 Twined Knitting. I keep thinking about what that 80-year-old woman in Leksand said. I couldn’t even walk 9.3 miles and certainly not while knitting. On the other hand it really also made me think about all the skills and techniques that have been lost or almost lost through the ages. What do you guys think? How have you specialized? How has your specialization helped your knitting? My goal this year is to have an uncluttered Christmas, and that includes the destruction of any and all seasonal leftovers. I have this old collection of red ornaments and fake pine cones and an ugly strand of of “ivy” or whatever it is, and with all the moving I’ve been doing the past 6 years, I’ve gotten to really hate them because all I do is keep them in storage or move them around. Not only are they unstylish, but I really don’t need them the other 335 days of the year, so they’ve got to go. These ornaments are a great solution to the clutter problem, because you can make them up quickly in a few minutes and then throw them in the recycling once you’re done with them. They’re bound to be crumpled at some point during the year anyway, so trash ‘em once you’re done with them and be free of Christmas Clutter!